Learn about animals and letters with every spin! the alphabet zoo ball is an interactive spinning toy that features three modes of play. 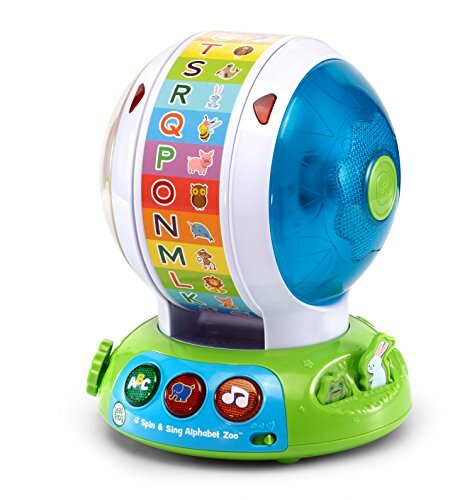 Your little one will have a ball as they press the three light-up buttons to learn letter names, animal names and sounds, and music. Every spin turns the inner wheel, triggering spinning balls on one side and projecting LED colors through a pattern of different shapes on the other. When the wheel stops, your child will hear either letter names or animal names and sounds. In music mode, they can sing along to the ABC song or a song about colors and shapes. Slide the Bee or press the frog and rabbit buttons to develop fine motor skills.